When did food start getting smaller? I’m not talking super-sized fries or ridiculous restaurant portions here (global obesity statistics suggest that serving-size is anything but under control), but pre-packaged foods: the biscuits, chocolate bars and ice creams of this world. The other day Carnivorous Fiancé was feeling a little bit under the weather. Food being my go-to solution for many of life’s smaller problems, I popped to the shops to buy him our ultimate childhood treat: a mint cornetto. Pulling it out of the freezer cabinet I was taken aback by how small it seemed, a thought only compounded by seeing it in Carnivorous Fiancé’s (much larger) hand as he polished it off in a matter of mere bites. Size isn’t the only issue in question with these childhood treats and sweets. Where once a mint cornetto felt like the height of sophistication, I now can’t help but notice the slight synthetic aftertaste of the ice cream, its lurid green colour and minty taste more akin to toothpaste than garden. While a nostalgic part of me still enjoys these foods from time to time, the baking part wants to improve them, making my own versions with a nod to the original but an identity all of their own. Take the mini roll. Staple of children’s birthday parties up and down the country (and lunchboxes if you were lucky. I wasn’t and tended to get carrots and raisins), the Cadbury’s mini roll is synonymous with childhood and, for me anyway, steeped in nostalgia. However, in line with what I’ve written above, they now seem particularly tiny and although I loved the taste when I was little, my grown-up palate would prefer something richer, more textured and full of flavour than the milky, vegetable fat-filled mini roll of today. 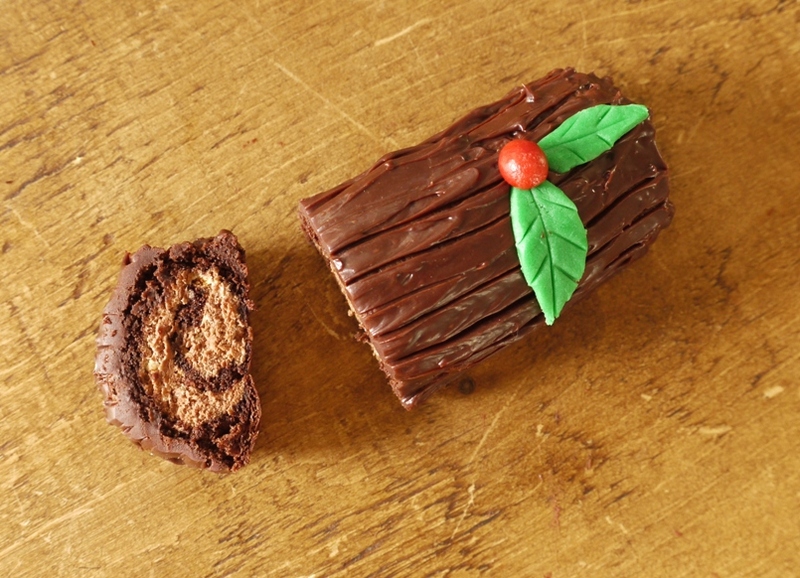 Hence the creation of these bite-sized mini rolls or Yule logs. After reading Felicity Cloake’s recent Guardian article on how to make the perfect Yule log, I was itching to get into the kitchen and experiment. We had a Christmas party to go to on Sunday for which I’d promised to do some baking, but rather than bring an unwieldy full-sized log that would need slicing and serving, I decided to attempt some miniature versions instead. To replace the sweet yet slightly bland filling of a Cadbury’s mini roll, I’ve created a booze-laden cream, rich with melted chocolate and crunchy from crushed amaretti. The sponge itself is flourless and light, allowing it to stand up to copious amounts indulgent filling and frosting, so the whole thing is covered in a truffly chocolate ganache. Each mouthful is a combination of dark, smooth chocolate and creamy crunch with a kick of almondy alcohol to boot. And because it’s almost Christmas, I’ve finished the whole thing off with a snowfall of sugar and some dinky little decorations. 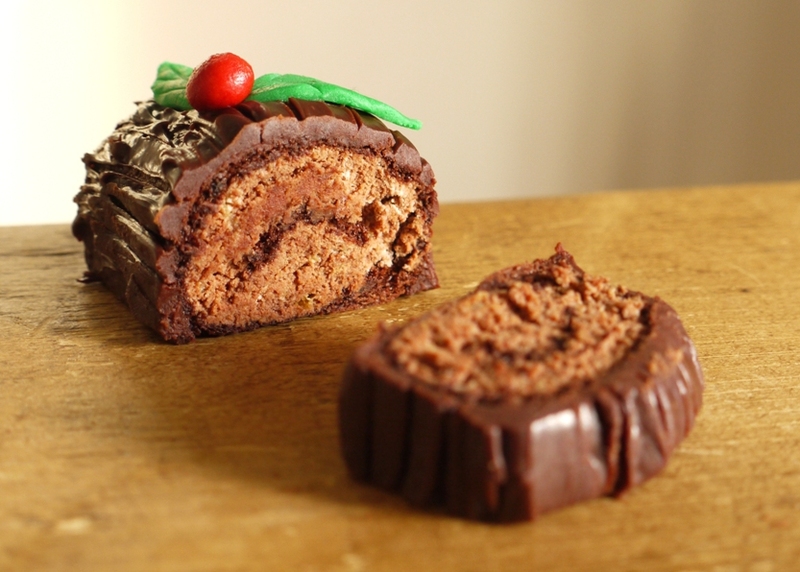 If you can’t be bothered to fiddle around with the miniature rolls, you could make this as a standard-sized Yule log, simply omitting the step where you slice the sponge into smaller pieces. But if you can, I’d highly recommend trying the smaller version: everyone gets their very own Yule log and they do look ridiculously cute. If you have to be a grown up and accept that things simply are going to feel smaller as you get bigger, you may as well do it in style. The recipe below looks like a lot of steps but they are all pretty simple. The most fiddly bit is covering the logs in ganache and if they don’t look completely picture perfect, they’ll still taste absolutely delicious. As noted above, you could omit the step where you slice the sponge into smaller rectangles and make this into one large yule log, if you like. Preheat the oven to 180 degrees C. Grease and line a large (mine was 23 x 33cm) swiss roll tin with baking parchment. In a large, clean bowl, whisk the egg whites until soft peaks begin to form. Add 50g of the sugar and continue whisking until the whites form firm peaks. In a separate bowl, whisk the egg yolks with the remaining 100g sugar until moussy, pale and thick. Sift in the cocoa powder, add the vanilla extract and whisk to combine. Fold one third of the egg whites into the chocolaty yolks to loosen, then fold in the remaining egg whites, taking care not to knock out too much air. Scrape the batter into your prepared tin, smooth the top and bake for 20 minutes. Remove the cake from the oven and allow to cool slightly before turning out onto a piece of baking parchment. Using a serrated (or very sharp) knife, slice the rectangular cake across the middle (from one short side to the other) so you have two long strips. Using the same knife, very carefully slice each strip through the middle lengthways so you are left with four long strips, half the thickness of the original cake. Finally, slice each remaining strip into four equal sized pieces. You should have sixteen little rectangles. Set aside while you make the filling. Whip the cream and icing sugar together until firm peaks form (being careful not to over-whip). Stir in the melted chocolate and liqueur then fold in the crushed biscuits. Fill a piping bag with the mixture and set aside. In a small saucepan, bring the cream and sugar to the boil, simmer for one minute then remove from the heat and allow to stand for one minute. Pour the warm cream over the chocolate and stir until the chocolate has melted and the mixture completely combined. Take one of your chocolate cake rectangles and lay it on a piece of baking parchment. Pipe the amaretti cream in a thin layer over the whole surface then roll the whole thing away from you. If any cream splurges out the edges, smooth it off with a palette knife. Repeat until all 16 rectangles are filled and rolled. Using a palette knife, spread ganache over the top and edges of one of your rolls. Smooth flat then drag the tines of a fork across the surface to create a bark effect. Repeat until all the rolls are covered with ganache. Decorate with holly leaves and berries, made with a small amount of pre-coloured fondant icing and firmed in the fridge for a couple of hours, dust with icing sugar for a snowy effect and serve. Gorgeous! They look so cute and the sound of amaretti biscuits crushed up in the filling sounds divine. Hoorah, since you mentioned you’d made something with same flavour combo as the choc, amaretto and amaretti ice cream I did recently, have been waiting for your post. They look gorgeous! Oh these are a vast improvement on the Mini rolls and I love anything that features Amaretto & Amaretti biscuits. I was watching Mary Berry make her Buche de Noel last night and I did think I should have made one for the children but your mini version they would love even more. Maybe I could swap the Amaretto for coffee? I am tempted to try them….as long as I get my wrapping done first! Under the Blue Gum Tree – the crushed amaretti are really good – they add both lovely flavour and texture. Kavey – thank you. I definitely need to try these flavours in ice cream form. Kerry – aw, thank you. My Kitchen Stories – we did indeed have Wagon Wheels although my Mum never really bought them. Sometimes we were allowed Club biscuits – they look tiny now! Laura – coffee would de delicious too, works so well with dark chocolate. I think realising just how fake and unpleasant most of the food that you enjoyed as a child tastes is one of the worst parts of growing up. Having read this, I’m not sure I’m going to be able to look at one in the same way. These certainly look vastly superior! Gorgeous! Good to see that they worked out. The filling sounds divine, I love the idea of a bit of crunch from the amaretti (I once put crushed amaretti in muffins with raspberries – so good). Ohh wow. This is gorgeous and looks DELICIOUS! Kathryn – I know what you mean, although sometimes it is still nice to indulge for nostalgia’s sake! 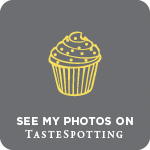 Emma – I’ve been looking for ways to use up the leftover amaretti biscuits. Was thinking of raspberry and amaretti brownies but may have to try your muffins too. Oh these are gorgeous!!! I would definitely welcome one of these at my Christmas table! And I know what you mean about favourite foods getting smaller and picking up on the synthetic taste. I used to be a fan of peppermint drumsticks (not sure if you get them there, but they are similar to mint cornettos) and now they just taste incredibly fake and they no longer hold the allure that they once did. 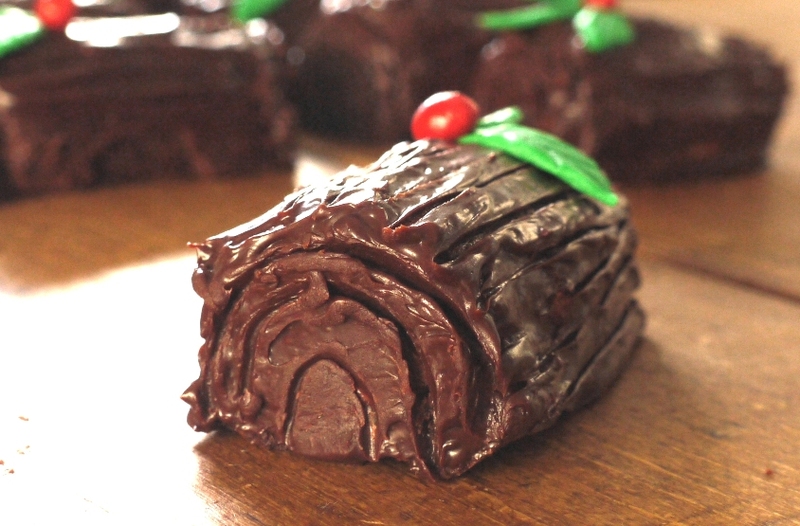 I’d much rather a batch of homemade ice cream, or one of these yule logs! Merry Christmas! I can’t wait to see what deliciousness you have in store for us for the new year. Too cute, and that filling sounds delectable! I’ve never liked mini rolls as you say, the filling is not nice at all although I’ve often thought they’d be great to remake at home. These look fantastic! JJ – it’s gorgeous, do give it a go. Awww, pure cuteness! No matter what time of year it is I’m sure this dessert will always be a show stopped. Well done you! I feel exactly the same about the foods I loved as a child seeming smaller and a lot less satisfying! 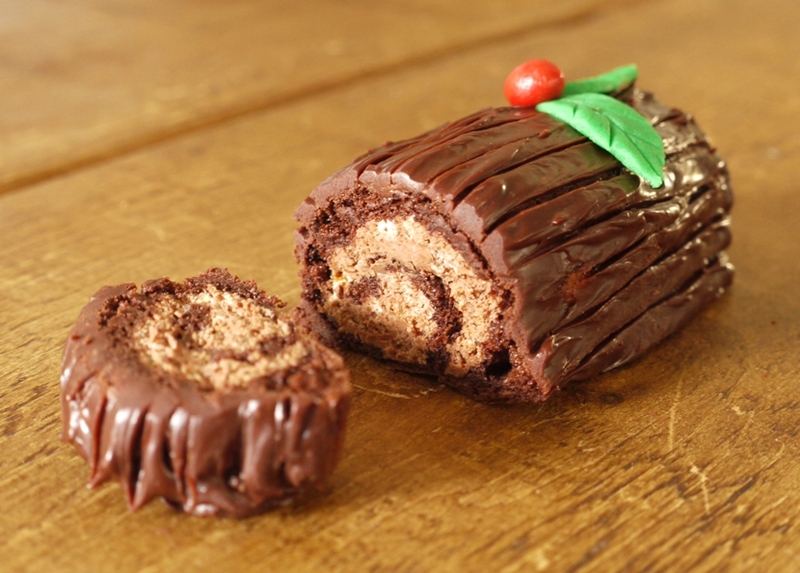 These mini yule logs definitely sound like they have the edge over the Cadbury’s ones…the amaretto cream sounds amazing. I’m so happy I finally got a chance to stop on by. Like I said, I’ve wondered about mini yule logs in the past. 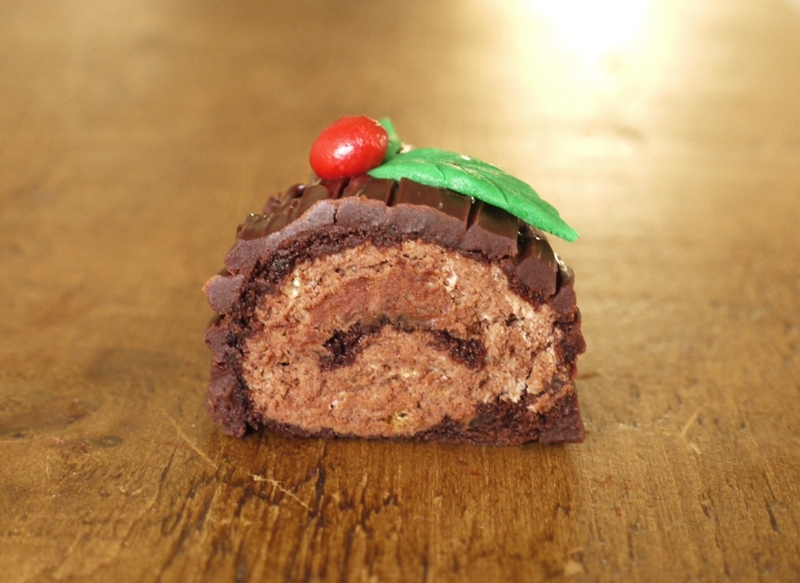 I don’t always like miniaturizing desserts, but after having tested a standard-size yule log recipe multiple times for a cookbook last year, I thought something like this would be adorable…and it is! And your version sounds oh-so delicious. I’ve never been a fan of mini rolls. I did love mint cornettos though and they are really disappointing now. Your mini rolls are in a totally different league to the Cadbury’s ones and sound absolutely amazing. You can’t go wrong with a bit of amaretto and amaretti biscuits, yum. OMG I totally know what you mean about everything being smaller! Buy a cake nowadays and read the packet in astonishment: ‘contains 12 servings’. Oh sure – of about an inch square. I don’t want an inch square. I want a piece of cake!!! Your yule logs look so yummy, I would make a batch and eat the lot. I love how you made mini logs. They really are adorable! 🙂 Maybe one day I will make a yule log. 😀 If so, I will be tempted to make mini ones because I notice that there is a higher chocolate frosting to cake ratio with them.